The successful operation of Elon's Happy Trails requires a diversity of resources. Our workshop is well equipped with all the necessary tools and jigs to construct airline kennels. Our pet crates conform and exceed IATA standards and are of the highest quality. We use the safest woods and products. We do not compromise on quality, because it is the safety of the animal using the crate that is paramount to us. 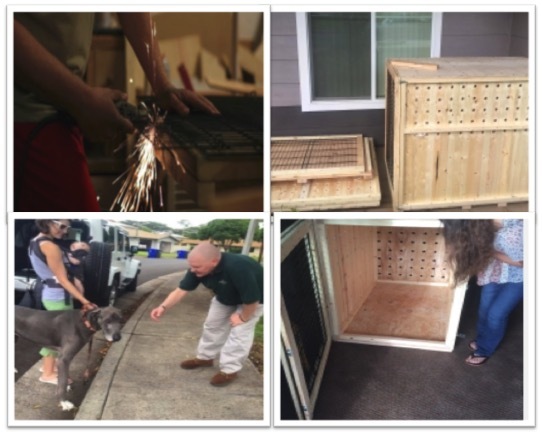 Like many military families they were under the impression that a standard plastic or the standard wooden kennel would be significant to ship their pit bull. Before LaShunda knew it she found herself creating kennels and forging strong ties with the airline agencies. Her focus is to help military members and their families transition in their pcs move. The number one concern for military members was the need of the kennel to last through several pcs moves. They are built military tough. Her personal experience as a military spouse and wood artisan; has allowed her to understand the demanding life of the military family. Being a military spouse of 20 years and a military brat for just as long totaling over 40 years of military life gives her insight to understanding the struggle of the military family. She can't forget her Ohana family who has supported her business and supported her through challenges. My ultimate goal is to keep as many furbaby’s and their human families together. To not have pet owners break the bank for kennels and airport transportation.